Looking for a new salad recipe to mix up your menu? 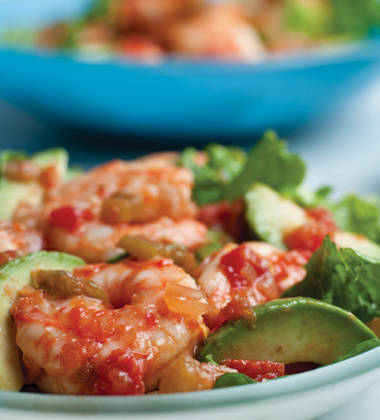 Try our Pico de Gallo Shrimp and Avocado Salad made with Pace® Mild Chunky Salsa. Extra large shrimp, cherry tomato, corn, avocados, and ranch dressing finish off the salad for the perfect blend of flavors. shrimp, x-large, peeled, deveined	 6 lb. 1. In large container or resealable bag, mix shrimp with 1 qt. 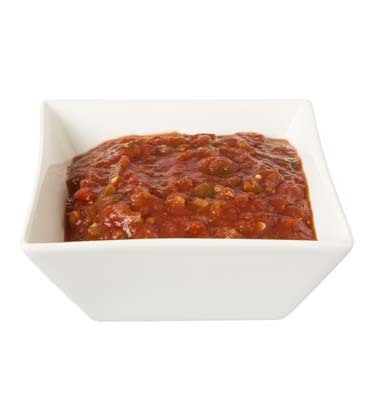 Pico de Gallo, toss well and cover; refrigerate 1-2 hours before cooking, mixing occasionally, during marinating time. 2. Remove shrimp from marinade and discard marinade. 3. Heat oil in large rondo or deep-sided skillet over medium-high heat; add shrimp and sauté 2-3 minutes until just barely cooked through. Remove from heat, drain and discard oil. 4. Toss shrimp with 2 cups reserved Pico de Gallo and coat well. Reserve. ranch dressing	 34 oz. 1 qt. 5. For Pico Ranch Dressing: In bowl combine 2 cups remaining Pico de Gallo with ranch dressing; mix well. Cover and refrigerate until ready to use. avocado, ripe, peeled, pitted, sliced	 42 oz. 6 ea. cherry tomatoes, cut in half	 30 oz. 1 1/2 qt. frozen whole kernel corn, roasted	 36 oz. 1 1/2 qt. 6. To Serve: For each serving, place 1 1/2 cups salad into bottom of a chilled salad plate. Top with 4 oz. shrimp. Place 1/4 cup (several slices) avocado around salad. Sprinkle top with 1/4 cup tomato halves and 1/4 cup corn kernels. Serve each salad drizzled with 1/4 cup Pico Ranch dressing. avocado	 42 oz. 6 ea. cherry tomatoes	 30 oz. 1 1/2 qt. frozen whole kernel corn	 36 oz. 1 1/2 qt.